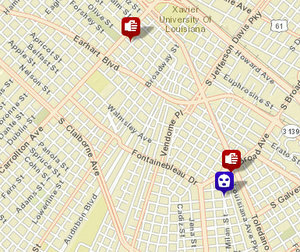 Two men were shot in separate incidents in Central City and the Lower Garden District over the weekend, and two women were cut in a dispute over card game in the Irish Channel, police said. Shortly before 8 p.m. Saturday, three women were playing cards in the 2300 block of Annunciation when they began to argue, according to the initial police report. One of the women, 25-year-old Wilkeitha Washington, got a knife and stabbed the other two, cutting a 27-year-old woman’s eyebrow and a 25-year-old woman’s hand and arm, police said. Washington remained jailed Monday morning on two counts of aggravated battery. Around 12:20 a.m. Sunday, a 21-year-old man was walking near Felicity and Rousseau when he heard gunshots, looked down and saw he’d been hit, the police report states. He got a ride to the hospital in a private vehicle. Around 6:20 p.m. Sunday, an 18-year-old man was walking in the 2000 block of South Robertson when heard someone running, and as he turned to look, gunfire broke out, hitting him in the foot, the police report states. 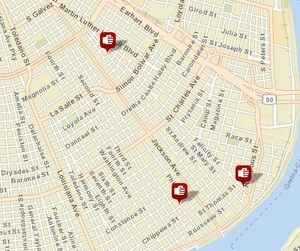 A rash of violence was also reported around the Broadmoor and Gert Town neighborhoods on Thursday, police reports show. Shortly before noon Thursday, two men were walking in the 8000 block of Olive Street when a white vehicle drove up, began shooting and then drove off, police said. The two victims, ages 21 and 27, were hit in the legs, the report states. About 5:40 p.m., 37-year-old man driving in the 3800 block of General Taylor pulled over to send a text message, when a vehicle with acquaintances of his pulled up along side him, police said. Several of them got into his vehicle, pulled a gun and ordered him out, and then drove off with his vehicle, the police report states. About 9:45 p.m. Thursday, several young men were standing in the 3900 block of Louisiana Avenue Parkway when an older model, dark-colored Jeep Cherokee drove up and a backseat passenger began firing on the group, the police report states. A 17-year-old was hit in the leg, the report states. Don’t worry, Susan Guidry had police officers checking college kids at the boot, and writing 19 yr old students tickets. Once again NOPD in the wrong place at the right time. Felicity and Rousseau is right in front of a police station! If these animals aren’t afraid to commit violent acts just steps away from law enforcement – then the battle is already lost.